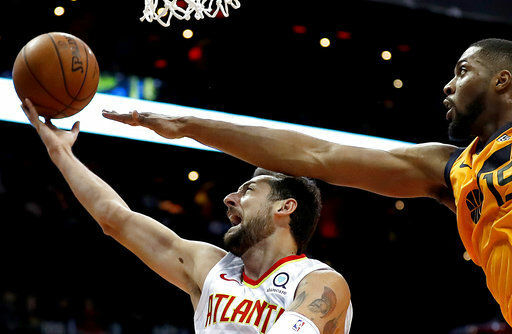 ATLANTA (AP) — The Atlanta Hawks are starting to see some results from their improved play. 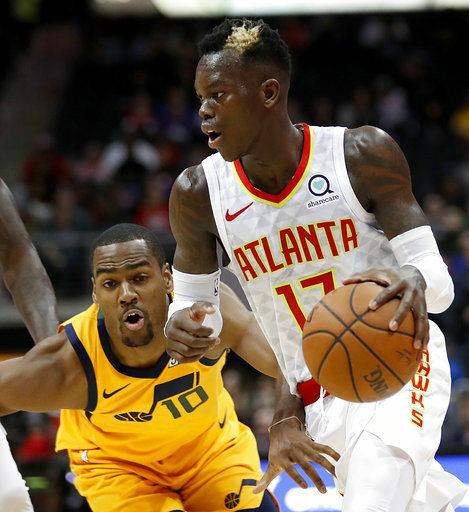 Dennis Schroder <a href=”https://twitter.com/NBA/status/955602174234546177″ target=”&mdash;blank”>scored 20 points</a> , Taurean Prince <a href=”https://twitter.com/NBA/status/955602174234546177″ target=”&mdash;blank”>broke out of a slump</a> with 17 and Kent Bazemore did a stellar job defensively, leading the Hawks past the Utah Jazz 104-90 on Monday night. Still saddled with one of the league’s worst record, Atlanta (14-32) has won three of its last four, four of six and is .500 over its past 14 games. “We’ve got to keep it going,” said Prince, who matched his scoring output from the last four games combined. 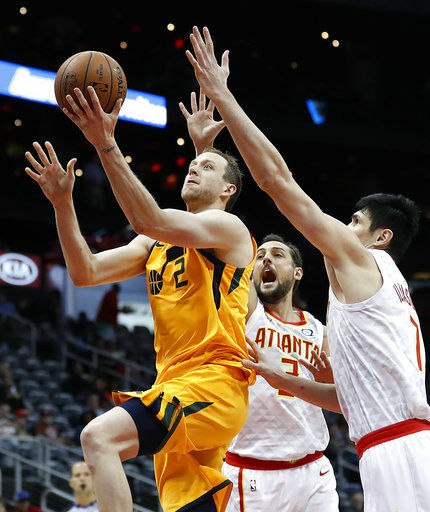 The Jazz missed their first five shots, and the Hawks put the game out of reach with a 10-0 spurt that included a three-point play from rookie John Collins and Bazemore’s jumper beyond the arc. Atlanta led by as many as <a href=”https://twitter.com/ATLHawks/status/955633237061124096″ target=”&mdash;blank”>26 in the final period</a> . Bazemore and Marco Belinelli had 11 points apiece for Atlanta, <a href=”https://twitter.com/ATLHawks/status/955629877763321856″ target=”&mdash;blank”>which knocked down 12 of 26 from 3-point range</a> . The Jazz, on the other hand, made only 4 of 15 outside the stripe. “There were times it looked like we didn’t want to play. 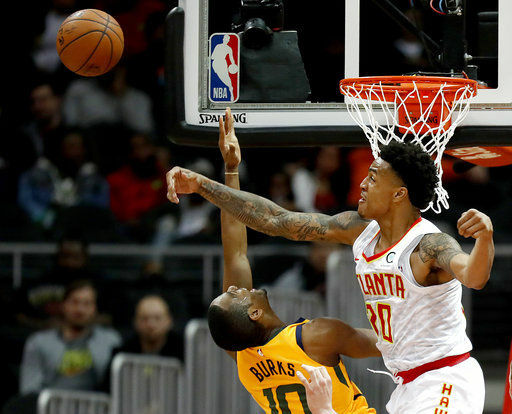 Including me,” said Donavan Mitchell, who was held to 13 points by Bazemore. Battling a hand injury, Prince had hit 7 of 24 shots for 17 points over the last four games. He made 6 of 11 — including a couple of 3s — against the Jazz. Alec Burks came off the bench to lead the Jazz with 17 points. Utah’s starters combined for just 40 points. At the end of the first half, the officials checked out the replay of a long jumper that Belinelli took with more than four minutes to go in the second quarter. Originally ruled a 2-pointer, it was changed to a 3 after the replay showed Belinelli’s foot behind the stripe. So, when the Hawks returned for the third quarter, they had a 42-41 lead instead of being tied at 41. Both teams converted four-point plays. Just before the midway point of the first quarter, Joe Ingles hit a trey — Utah’s first points of the game — and tacked on a free throw after being fouled by Prince. Then, late in the third quarter, Delaney swished a 3 from the corner. He was fouled by Royce O’Neale and made the free throw, giving Atlanta a 72-63 lead. Jazz: Travel to Detroit on Wednesday to face the Pistons. Hawks: Wrap up a six-game homestand, their longest of the season, by hosting the Toronto Raptors on Wednesday.